அறவாநீ ஆடும் போதுஉன் அடியின்கீழ் இருக்க என்றார். “I pray for the infinite happiness of Your love; I do not want to be born again; if I do, I do not want to forget You forever; if I do, I want to be happily singing in Your praise under Your feet as You are dancing”. As a normal oratorical speech would start, we cannot start by saying ‘Karaikkal Ammaiyar’ needs no introduction. Indeed, Karaikkal Ammaiyar needs introduction in today’s Tamil World. The world knowing her is secondary; the Tamil World of today’s Youngsters and English Educated Middle Aged Parents – most or half of the population not knowing her is certainly a pathetic scenario. But for Indians – Being Well Rooted in one’s own traditions as well as Being a Global Citizen doesn’t seem to materialize. While the choice of being a global citizen has become the PRIDE of present generations, one doesn’t realize the resultant loss of identity due to loss of roots. The primary task of each generation which used to be passing on the roots to the next generation has become secondary. But, making their progeny succeed in any part of the world by having no single identity is a NORM of the millennium. A pity though. To introduce Karaikkal Ammaiyar, introduction of Nayanmars is quintessential. Nayanmars were Ardent Devotees who sang in praise of Lord Shiva in humble Tamil and connected with the masses. In an attempt to cut off the influences of Buddhism and Jainism, these Primary Devotees of Tamil Bhakti Movement took up Shaivism. Their pure love and selfless affection towards Lord Shiva was a powerful tool against other religions. Their priceless possession was not only Devotion and Selfless Love, but incomparable literary skill that made them reach out to the common man in his own language. There were 63 Nayanmars, who lived and sang from 6th century until 12th century ACE, without doubt creating a wealth of Bhakti Literature that stands even today to hold the importance of worship of God in Tamil. Beyond being a tool against other religions, their belief in love and devotion alone to reach Shiva is the keypoint in all the songs that the Nayanmars sang. Belief in one’s God and being able to relate and communicate with that One Almighty in one’s own mother tongue and non-dependence of Sanskrit to communicate with that God could be a few fundamentals of the Tamil Bhakti Movement. Great credit goes to the Cholas for bringing to light the compiled version of the songs sung by 63 Nayanmars. King Rajaraja Cholan appointed Nambi Andar Nambi, a priest in Thillai – the original Tamil name of Chidambaram Shiva Temple, to compile the devotional literary works of Nayanmars, sprawling over 5 centuries then. Nambi compiled the works of the 63 Nayanmars into 11 volumes and added his own work in the 11th volume. The works of Sambanthar, Appar, and Sundarar form(ed) the first seven volumes and they are called Thevaram – or the Garland of the Gods; Manickavasagar’s Thirukkovaiyar and Thiruvasagam form(ed) the 8th volume. These four nayanmars are classified as the Most Reverred Beacons of Tamil Shaivite Bhakti Movement (Samaya Kuravargal), among the 63. During the reign of King Kulothuga Cholan II, his chief minister Sekkizhar/Chekkizhar travelled across the places of birth and travel of the 63 nayanmars and compiled their life histories. He named his biography of nayanmars in poetic verses – ‘Thiruthondar Puranam’ – the story of the servants of God, which is popularly called ‘Periya Puranam’ – the Big Puranam. Sekkizhar’s Periya Puranam added as the 12th volume to the previous collection of 11 volumes is called ‘Panniru Thirumurai’ – The Tamil Saiva Literary Canon. Rajarajan, who gave the Nayanmars their deserving Elite Place in Tamil Saiva Literature and Tamil Saiva Movement is hailed as ‘Thirumurai Kanda Cholan’ – that can be broadly described in English as ‘the Protector of Saiva Religion and Literature’. The sacred collection ‘Panniru Thirumurai’ is a unique Literary Excellence which showcases 600 years of devotional movement of surrendering to the Lord, the extra ordinary emphasis being the worship in one’s own mother tongue. Thevaram and other hymns still adorn the Temples of Tamilnadu and homes of Tamil Worshippers around the world. All the saints mentioned in this epic poem are historical persons and not mythical.Therefore, this is a recorded history of the 63 Saiva saints called as Nayanmars (devotees of Lord Siva), who attain salvation by their unflinching devotion to Siva. The Nayanmars that he talks about belonged to different castes, different occupations and lived in different times. Among the 63 Nayanmars, Karaikkal Ammaiyar was a Pioneer Tamil Saint in many ways. She was one and first among the three women Nayanmars. She is addressed by scholars and researchers in many ways. Apart from Karaikkal Ammaiyar, she is also called ‘Siva’s Demon Devotee’, ‘Karaikkal Pei’ – meaning ‘Ghost of Karaikkal’ in tamil due to her looks and ‘Peyar’ – the revered ghost. Giving least importance to beauty and worldly pleasures, she wished and prayed for the demonic form and her wish was granted by Shiva. She can be recognized as an emaciated/skeletal figure at the feet of Shiva in sculptures. She composed Thiuvirattai Manimalai, Arputha Thiruvanthathi and Thiruvalankaatu Mootha Thiruppathigangal. To know more on Ammaiyar, google ‘Karaikkal Ammaiyar’ and the web world welcomes you to introductions and many research papers. When I came across the book in the internet, Karaikkalammaiyar: An iconographical and textual study By Peter J. J. de Bruijn, it threw a new light on Ammaiyar in Cambodia. The book specifies the places where Ammaiyar was found in demon form sitting below the beautifully carved ‘Adalvallan – Nataraja or the Dancing Shiva’. 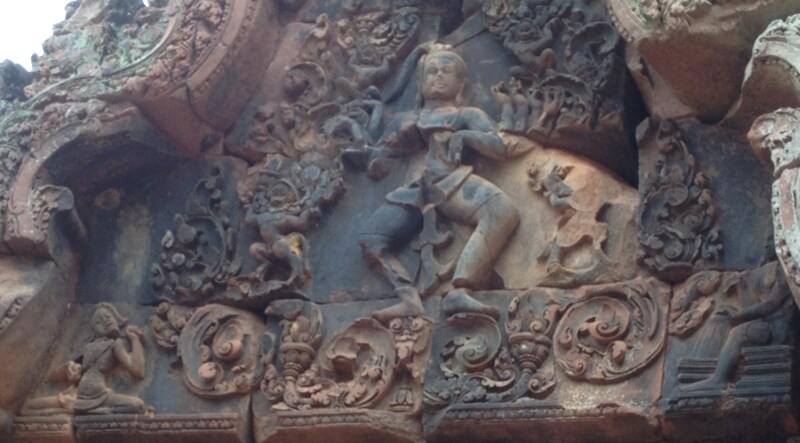 This is what Ammaiyar sought from Shiva – to sit at his feet while he dances. This is exactly the form of portrayal in sculptures in Tamilnadu and other South East Asian countries. The book specifies the places in Tamilnadu and places in other countries where Ammaiyar can be seen. This seemed very interesting. While Ammaiyar sculptures in Banteay Srei and Phnom Penh Museum had already been seen, Vat Ek and Vat Baset became the next search spots. Vat Ek and Vat Baset are located in Battambang Province of Cambodia. Both temples are in natural ruins, added with a new Buddhist Temple in front of Vat Ek. Unfortunately couldn’t find Ammaiyar in Vat Ek. 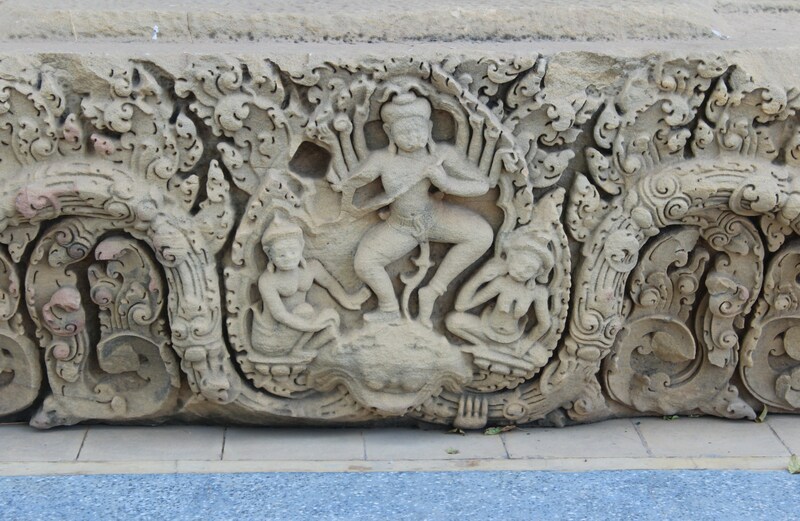 But surprisingly Battambang Provincial Museum had three sculptures of Ammaiyar. One Lintel and two broken pediments. They have also recognised Karaikkal Ammaiyar and given a description in their museum booklet. Let us try to bring in more historical facts of the temples where Ammaiyar’s sculptures are available in temples in Cambodia. The book – ‘The Indianized States of South-East Asia’ by George Coedes provides a clearer picture about the King who built Vat Baset and his relations with the Chola Empire of Tamilagam. The accession of throne by Surya Varman seems to have been a complicated affair. Two inscriptions mention of one Udayadityavarman, cousin of Jayavarman V who comes to throne in 1001. In 1001 and 1002, there are four inscriptions referring to Suryavarman, who belongs to royal ancestry in the female line. From 1003 to 1006, King Jayaviravarman is mentioned in inscriptions and according to his inscriptions he establishes the throne of Angkor from 1011. In the following pages of the book, the author also gives more details on the capturing of throne by Suriyavarman after nine years of war, approximately in 1010. Later in his inscriptions, he dates his accession as year 1002, the year of death or disappearance of King Udayadityavarman I. In 1012, Suryavarman feeling threatened by the Srivijaya King Maravijayottungavarman, seeks aid of Rajendracholan I by presenting him a chariot. Later, Rajendra Cholan I launches a war against the same Srivijaya King. The first half of the eleventh century, during the long reign of Suryavarman I, saw indeed the empire become more vast, populous and prosperous. The first Linga was consecrated at Vat Baset, 70 km to the south-west of Angkor. – Phnom Chissor, a sacred hill located 270 km to the south-east. – Isanatirthi, somewhere in the east. Among the five temples where Karaikkal Ammaiyar is sculpted in Cambodia, Phnom Chissor, Vat Ek and Vat Baset are all built by King Suryavarman I. 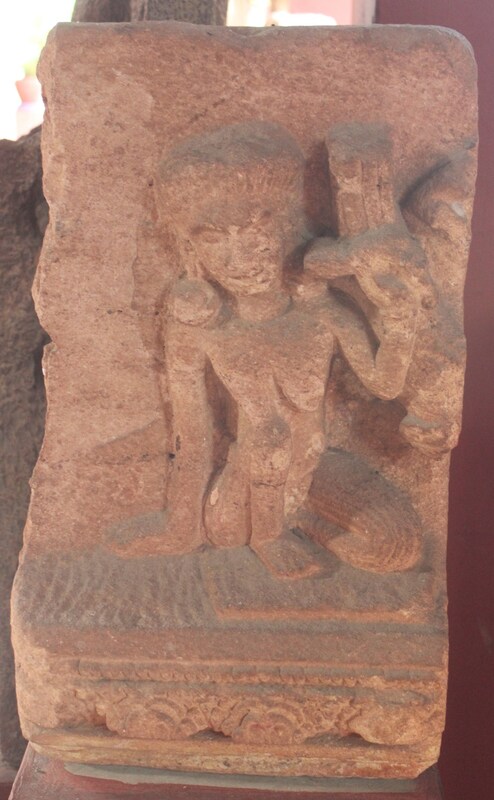 The same Rajendra Cholan – I, with whom Suryavarman sought friendly relations, built Adalvallan – Nataraja or the Dancing Shiva with Karaikkal Ammaiyar in his Gangai Konda Cholapuram Kovil (temple). Before Rajendra Cholan, his father Rajaraja Cholan immortalized Ammaiyar in sculpture in his Thanjavur Brihadeswara Kovil. Could this throw any light on the historic tamil connection of Karaikkal Ammaiyar in Cambodia? 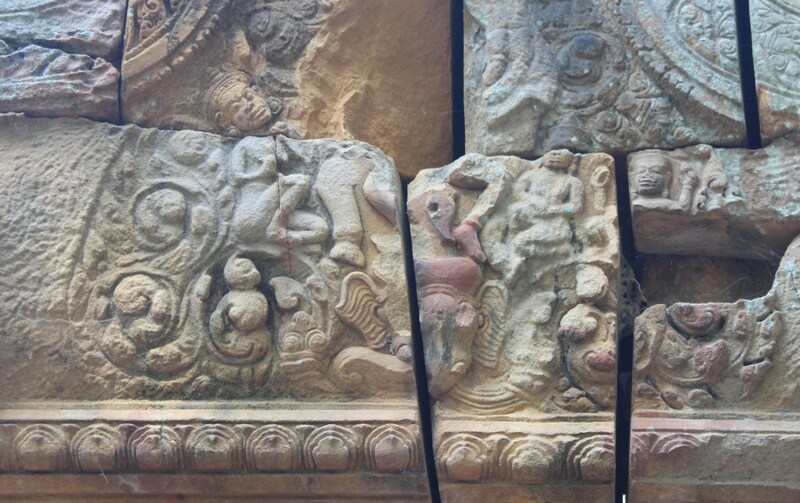 But, Vat Baset is certainly not the earliest temple with Ammaiyar sculpture. 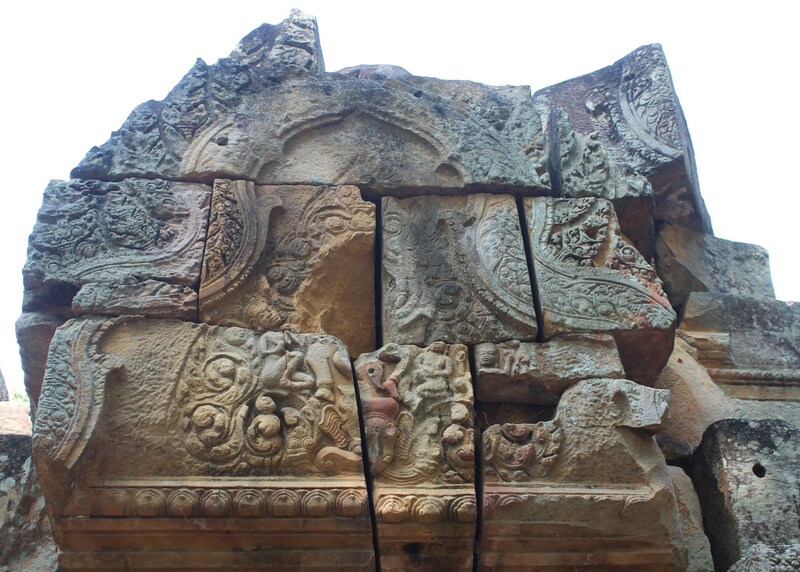 Banteay Srei temple in 10th century is earlier. This would be discussed in forthcoming posts. Adalvallan/Nataraja or Dancing Shiva and Karaikkal Ammaiyar – the duo sculpted in South-East Asian temples, kindles more interest in the Yesteryear relations among these Kingdoms and Tamil Kings. Let’s try to explore further to decipher more…..